High-field techniques that are now possible on benchtop instruments. Applications and problems solved by advancements in benchtop NMR spectroscopy. The size, ease-of-use, and economic advantages of benchtop instruments over high-field machines. In recent years benchtop NMR spectrometers have become an increasingly viable alternative to high-field systems. Many demanding resolution and sensitivity requirements can now be met with modern methods and instruments. 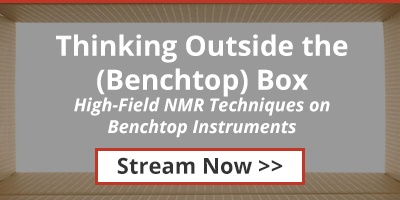 In this webinar we illustrate how a number of well-established and modern high-field NMR techniques, such as 2D, non-uniform sampling (NUS), and pure shift experiments, can be implemented on a benchtop NMR system to solve problems and applications previously considered beyond reach.